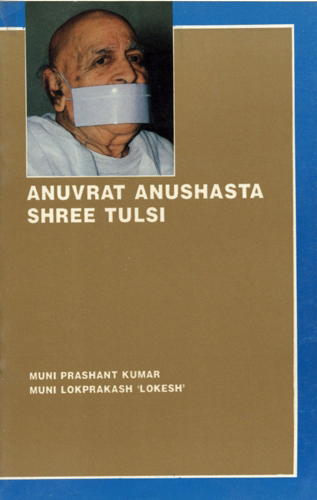 The Preceptor of the Anuvrat, Shri Tulsi, is one of the most adorable torch-bearers of the great spiritualistic tradition of India. People designate him a "Messiah of Humanity". His strenuous efforts for integration of human beings are well known to the masses. His slogan - "Let human be human first, and then he called either Hindu or Muslim" has created a feeling of tolerance in people of diverse creeds. His thoughts and action have made him "an eminent saint of humanistic trend". "Universal Friendliness" is not a mere concept for him, but is also a mission for him. His long journey of forty years for this mission is still going on towards its noble destination. Which is ultimately nothing less than inter-weaving permanent non-violence and peace in the global fibre. His 100000 kilometer long peregrination on foot all over the country has enforced the achievement of his goal. Not only people of all classes, all status and all professions have welcomed his thoughts but also have accepted them. Moreover, the greetings from the World Organisations to this mission prove the cultural heights of India. Shri Tulsi has struggled for the whole of his life as a protagonist of "non-sectarian religion" for finding a conceptual solution to the problem of communal conflicts and for bringing about the purity in conduct in day to day life to eradicate immorality from it. There is a long chain of his outstanding contributions to the country and also to the world, for which both the nation and the humantend will remain undeleted to him. His genius cannot be described in a few words, lines or pages. It is really "indescribable". Nevertheless, we have tried to give a glimpse of his magnanimous personality to satiate the thirst of the delegates participating in the lllrd International Conference on Peace and Non-violent Action.